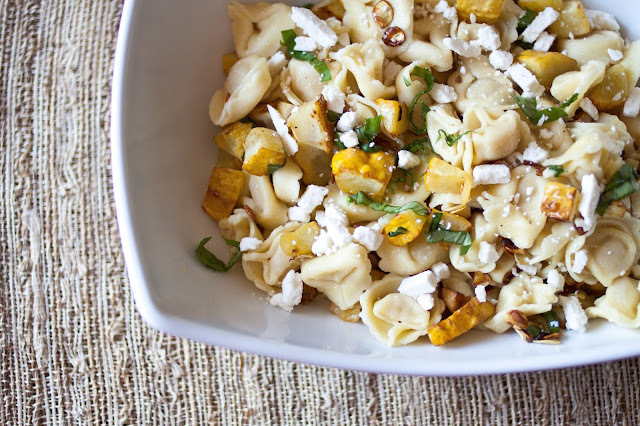 I Love You More Than Carrots: Summer Squash, Feta and Tortellini Toss. For the second summer in a row now, our backyard garden puts out monster squash and I'm constantly on the hunt for new recipes in which to use it. From boats to breads, soups and salads, there's only so much zucchini bread and squash boats a family of four can take! Thankfully, it was during a recent lull in couch-surfing and stair-diving that I had a few moments to look through one of my recent editions of Real Simple magazine where I stumbled on a delicious recipe for gnocchi and summer squash. You'll note that I altered this recipe a touch, mostly because I didn't have any gnocchi on hand and despite my alterations, this dinner was delicious! The perfect light and fresh meal for a warm summer evening on the deck! Prepare tortellini as directed on package. While tortellini is cooking, generously coat a saute pan with olive oil and heat pan over medium-high heat. Toss in garlic and squash and season with salt and pepper. Let cook, tossing occasionally, until slightly browned on the edges, about 6-8 minutes. You want your squash to be cooked enough that it's crisp not mushy! Drain tortellini and toss with squash and Feta. Garnish with chopped basil and enjoy! Edited to add: Even though both my husband I loved this meal, we did think of a few things we might add the next time around. Pancetta or even crumbled mild Italian sausage would taste divine. Maybe throw in a handful of fresh cherry tomatoes, too! We paired this dinner with a crisp Sauvignon Blanc. Yum! Tell me, do you have any great recipes that include summer squash as the star? Judging by the size of this year's garden, I have a feeling I'm going to need to have a few more recipes on hand! 1. chop veggies. prepare dough. preheat oven to 400 degrees. 2. combine cream cheese with dill, garlic salt, and other desired seasonings. 3. brush a large baking sheet with olive oil, and stretch dough out in the pan. 4. spread the cream cheese mixture over the dough, sprinkle with parmesan. 5. arrange 1 row of zucchini slices down 1 long side of the dough. arrange onion rounds in a row alongside zucchini. repeat until all is used. brush vegetables with olive oil and sprinkle with s + p.
6. bake until puffy and golden brown, about 24 minutes. sprinkle with fresh herbs. 2. In a medium bowl combine breadcrumbs, cheese (if using) and black pepper. 3. In separate bowl add flour, milk and vinegar. Gently stir until combined but do not over stir. 4. Dip zucchini slices in flour mixture and then dredge in breadcrumb mixture. 5. Place coated zucchini slices on a baking sheet (I line mine with non stick foil for easy clean up!) and bake for 30 minutes, flipping the slices over once halfway through cooking, or until browned and crisp. And this is my most favorite thing to make with zucchini or squash!! Separate crescent dough into eight triangles; place in a greased 9-in. pie plate with points toward the center. Press onto the bottom and up the sides of plate to form a crust; seal perforations. Ummmm...YUMMY!! That sounds absolutely phenomenal and super easy, which is right up my alley!! I think I could handle that! Thank you for sharing this amazing recipe!! I made this tonight and added in your suggested Italian sausage and cherry tomatoes. This meal was SO good and so quick to make. I can't wait for the leftovers tomorrow. Thanks so much for sharing!